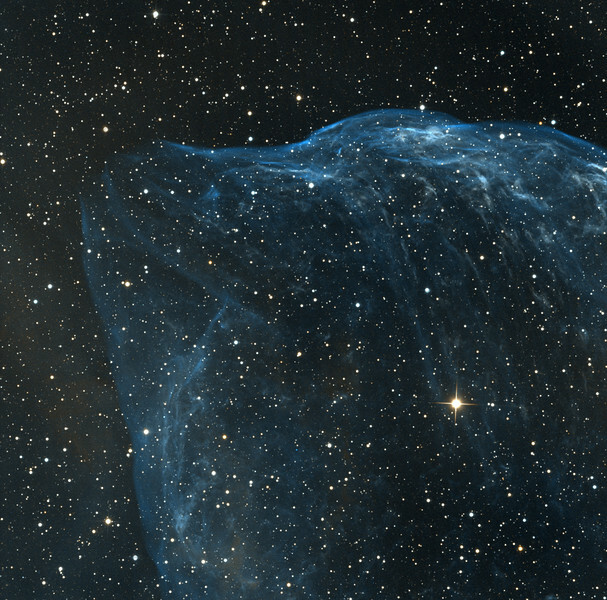 NW part of Gourd Nebula (RCW 11 or Sharpless 308) in Canis Major. Can you see the nose and forehead of a dolphin? Orange: H-alpha (5hrs, of which 3hrs unbinned, 2hrs 2x2 binned), Sky-blue: OIII (4hrs, unbinned) all in 1hr subs. We are quite proud of this image as the detail is very sharp for such a faint object. The H-alpha is extremely weak, and has been greatly stretched to be visible at all. Conversely, the object is bright in OIII, indicating lots of hard UV from the central star. Aspen 16M on 20" PlaneWave CDK.